Well, if you’ll pardon the pun, this is a breath of fresh air! South Korea’s national health insurance body sued three cigarette makers for at least 53.7 billion won ($52 million) as compensation for health-care costs linked to smoking-related diseases. Is any one else getting a bit jaded when companies refuse to accept responsibility for their actions? I cooked and ate some bad meat two days ago. First time ever doing that and I think the Pork Cutlet I had after that didn’t help(greasy?). Suffice to say my Sunday night didn’t end till 4 am and a rather watery regurgitation of the day’s intake. I felt tons better and was finally able to get to sleep. Next day I felt ok but still not quite right. Didn’t eat too much but no reoccurrence of food coming out the wrong end. 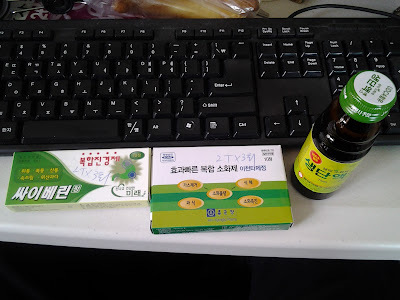 Today I still don’t feel quite up to par so I decided to give some Korean Medicine a try. He said that I need to take two pills from each box, 3 times per day and drink this liquid. I just drank the liquid and it’s not horribly unpleasant. Not something I would drink casually but could have tasted worse :) Pills have been taken as well now. So we’ll see how this turns out in a day or so. I’ll update as things progress. Oh, and the total cost for this stuff….about $5. Who needs to spend taxes on national coverage…this stuff is cheap! I rarely see a doctor. Not because I have anything against them or some weird aversion to the medical profession. I generally don’t get sick. Sure I am a little overweight , and being Korea has helped that due to all the extra walking one has to do to get around I have been slowly loosing weight but also gaining some muscle. So technically I am loosing weight be gaining mass :) just to clarify the difference. Your weight is what changes when you go to the moon but your mass stays the same. Last month something happened to my knees. It is like I over worked them. I figured a few days of rest and it’ll be fine but therein lies the dilemma of being in Korea. There is much more walking, stairs to climb for exercise but what do you do when its your legs that need the rest? Unfortunately I do not have the luxury of sitting around for 3 – 4 days and do nothing. So the healing becomes a significantly slower process with the possibility of doing more damage without really helping at all. While at a movie two nights ago, I was about halfway through I was getting some pretty severe pain in my right knee. To the point that I was considering leaving the film. If I could have just stretched out the leg I would have been fine but the seat in front of me only afforded me limited flexibility. So I went to see a doctor. I have always been partial to alternative healing and I knew of a place near a Korean friend of mine that did acupuncture. My friend offered to help with the Korean. While they did speak English, they were better at explaining things in Korean and my friend explained in English. First, I should mention that the bed, while somewhat stiff, was heated. Very comfy but only to a point. The doctor placed four rubber suction cups at various locations around my knee. These cups had lines attached to them and had sponge on their insides. 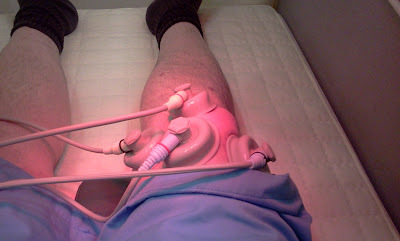 The machine applied both a vacuum and an electrical stimulus to the knee area. 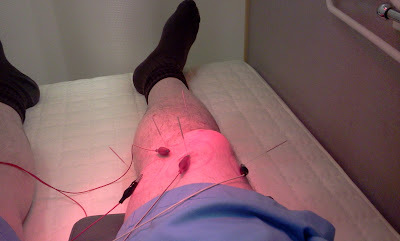 There was also an infrared lamp over the exposed knee as well. It was rather unique to experience such a treatment. After about 15mins of the suction/electrical shock that varied in patterns my knee was feeling pretty good but we weren’t done yet. The assistant places a towel wrapped hot pack in my knee and leaves then the doctor returns in about 5 mins or so. NOW they brought out the acupuncture needles. He put 5 of them around my knee then attached alligator clips with wires to them. More electrical shocks to the muscles it seems. 15 more minutes with this. Feels a little more intense but not painful. The assistant comes in and removes everything and informs me there is one more step! I am wondering how much more work can be done?! She tells me it will hurt a little but not to be concerned. I shrug, certainly won’t hurt more than what I have experienced from the pain in my knee a few days ago. The doctor comes back and has a couple of weird things I’ve never seen. One of them looks like a hand pump and a little add-on looks like a suction cup type of device with some gauze in it. There is another hand device but I can’t quite make out what it does. The staff is very good at not making it obvious. The doctor swabs an area just left of my knee and takes the other hand-held thing and pricks my skin about 8 times in rapid fire strikes. Ok so that kinda stung. I watch the doctor place the ‘suction cup thingy’ over he area and then attach the hand pump, he pumped it a few times and then left for about 5mins. My leg bled slowly into it and the gauze was soaking up some of it. I just kinda watched with a bit of morbid fascination and was amazed that ‘leeching’ was still practiced on a daily basis. The doctor came back, removed the suction cup thingy cleaned up my skin a bit and left the assistant to finish. I asked her what was the purpose of that and she it was too hard to explain in English(her English was pretty good). Then they let me go. Since this procedure was covered (and by that they mean mostly) by the Government, it only cost be KRW8400(about $8.40). My knee did feel better and there is supposed to be a follow-up for the next three days bit I have plans already so I’ll do it next week. I was told that this is only a symptom of a larger issue which is not necessarily related to my weight. Who knows but I’ll be keeping an eye on things. Those who are old enough to remember the old Raid commercial know the ‘fear scream’ the bugs always did. I do my best to find the best in others but there are times I seriously question people’s motives for doing things. Like the lady who sat in front of me wearing perfume that smelled like Raid. No I am not kidding. I was actually starting to feel a slight but nauseous. I was supremely relieved when she got up and moved to the other side of the bus. I suspect it was due to her not want to be sitting in the sun, and thereby forcefully exuding more Raid perfume to the rest of us but also sweating. Maybe she picked up on my restrained gagging reaction? In either case, her bug-killing aura left with here with only a faint “oh dear” left lingering in the atmosphere. Author DragonDonPosted on June 16, 2011 January 7, 2013 Categories ContentTags health, Korea, perfume, South KoreaLeave a comment on RAIIIIIIID!!!! Here’s a typical day for me now. 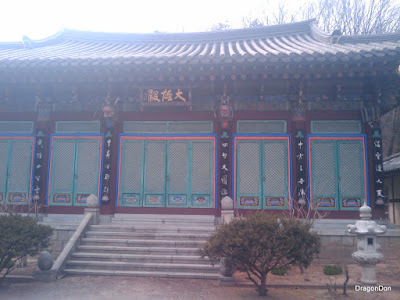 A rhythm has been slowly developing around my activities and actions in Korea. I have done a good amount of networking and met lots of people. I have identified a number of opportunities and they are working out well. Here is the cumulation of what I have accomplished so far, as described in a day that is slowly becoming a regular pattern. 7am. Alarm goes off. Not mine, my wife’s. She gets up and gets ready for work and leaves about 7:40am. 8-8:30am I give up trying to go back to sleep. So I get up and get ready for the day. 10am Meet one of our new Korean friends for a morning hike to a local mountain(Dobong). Grab a coffee along the way. – Now, I would normally have inserted pictures of said hike but the brand new camera (bought just 2 days ago) had a dead battery. It’s a Sony Cybershot and I had left it plugged into my Netbook to unload the pictures I took earlier with it. As it does not charge through the USB cable (wish it did), and I left it in ‘USB Transfer mode’, the battery died overnight. Ugh. Will have pics on my next outing. 12:30pm. Back home to shower after the hike. 1:30pm Watch some videos/work on websites/geek out. 10pm finished and on way home. Although I am currently only doing the mountain a couple of times per week. My first time (last Tuesday) was in running shoes and jeans. My ankles were sore (lots of new ways to twist when climbing non-flat surfaces) so I bought some proper hiking shoes. Today, it’s the front of my lower legs (Tibalis Anterior and Soleus for you medical types) that are sore because my ankles are no longer flexing as much but the rest of my leg was. Oh, and my ankles were sore but that was mostly due to them not fully recovered from Tuesday and more work for them again. I think that every subway stop in Uijeongbu (in case you forgot, that’s the city we live in. It’s kinda like the Mississauga-to-Toronto of Seoul) will let you walk to a mountain. Mangwolsa station is no different. 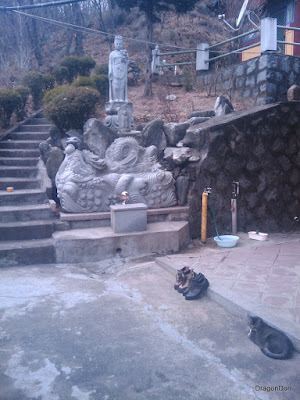 We didn’t really get into the mountain, just far enough up to visit a Buddhist Temple. Although we didn’t go inside, it was still worth the walk. Now, what story isn’t worth telling that didn’t have a good starting point? This pic suits that need. 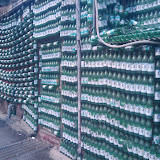 Those are empty bottles of Soju (click link to learn more about it). Basically it’s like vodka but made from rice. And while you may be tempted to think that the owner requested a couple hundred empties from the manufacturer, I need to point out that many of the nation’s hikers are ‘elderly’. Meaning 50+. 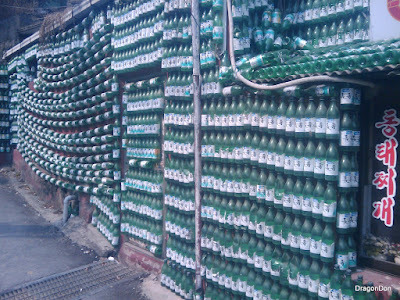 A very common thing for them to do is to bring bottles of Soju with them and drink at the top of the mountain, then stagger back down to the subway. So I am fairly confident that these were all from customers over the years. The walk to the Temple here is not that long at all. It was a quiet day for hikers so we only passed about 20 or so of them. The temple was quite beautiful. Then again, they all are. I am so glad I have been given the chance to see them. 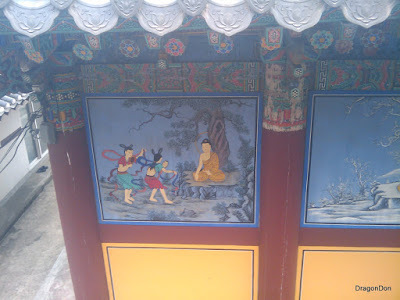 This is but one of many different paintings on the back of the temple. Click on the album link below to see more of these. Click on the following to see the whole album. Congrats to Shawn Brush for being the first person to correctly guess the Korean word translation. Got a special prize soon to be shipped for you! Author DragonDonPosted on April 14, 2011 January 7, 2013 Categories ContentTags health, healthy-living, hiking, Korea, nature, outdoors, South KoreaLeave a comment on Here’s a typical day for me now.